The first skatepark in the reclaimed suburb of Hulhumale was unveiled last Friday, to great support from the locals. The development of the skatepark was headed by Euro Marketing Maldives and Red Bull Maldives, in conjunction with international design and build companies, Fifth Pocket, Wonder Concrete, Skateparc and Alis. With a crew of total 45 members from over 15 nationalities, including 10 locals and eight expats, the diverse team of skaters, skatepark designers and builders, construction crews and business owners, completed the park in a period of 29 days, from March 28 to May 4. According to Euro Marketing, the idea to construct a skatepark in Hulhumale was formed back in 2014. The company had then signed an agreement with Housing Development Corporation (HDC) to commence the project. Four years later, Euro Marketing unveiled the skatepark at a soft opening last Friday. 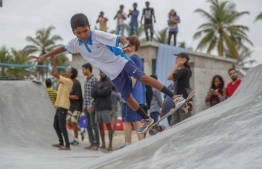 With music, entertainment, food and a special skate exhibition, 40 children from the island of Goidhoo in Baa Atoll were invited to participate in the ceremony, where the international crew of builders had provided free skating lessons. Moreover, Jenna Hirt, the founder of the charity "Donateforskate" which creates skateboards of children in developing countries, also gifted 21 skateboards to local children. Euro Marketing revealed that the skatepark, which spans an area of 10,000 square feet, now features a Skate/BMX park as well as futsal and volleyball pitches with free public access. The most unique aspect of the project, the company said, was that the whole park was built freestyle, based on ideas and inspiration from the building team, as opposed to following a previously designed plan. This is most prominently reflected in the centrepiece of the park - an Orca that ended up with the head of a whale shark, fondly called "killer-whale" by the crew. Regarding the project, the crew, which was remarkably made up of only volunteers, expressed hopes that the skatepark could be a safe-house where children could enjoy themselves. “I think that the way for Maldives to move forward in skateboarding is to build more parks; not only here, but in other islands across the atolls. I think that the schools should be more involved – incorporating skateboarding into their extracurricular activities would be a great way to get the kids involved in something that they can focus their energy on as well as providing a safe escape from the everyday."